This post is for the sake of discussion. See the photo below. This billboard is at the corner of Second Ave. and Cleveland Ave. I drive by this intersection a few times a week while on the way to meetings as well as to add revenue to St. James Tavern. Looking at this billboard, my first thought was – hmm – not very good advertising. Then I started to think, wait a minute, maybe this is graffiti / vandalism / social commentary (i.e., the cockroaches? ). Then, when I stopped to get out of my car to snap a photo, I noticed this written among the bugs “Gov. Kasich says”. Hmm maybe it is social commentary. It definitely is intriguing. As for my comments on Fair Food, it is good, if you know where to go and what to eat. We did a Foodcast episode on it a few weeks ago. Readers, what do you think about any or all of the above? This entry was posted on August 26, 2012 at 8:27 PM	and is filed under food. You can follow any responses to this entry through the RSS 2.0 feed. You can leave a response, or trackback from your own site. 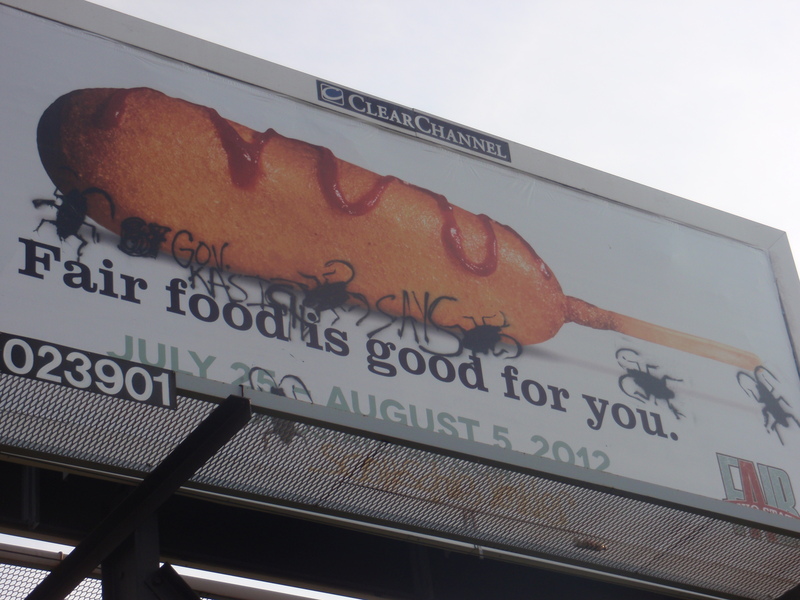 My first reaction was that a corn dog would not be my first choice of fair food to feature on a bill board. Then I thought about the play on words of “fair food” – what if it was social commentary about “fair” (as opposed to un-fair) food? What would food in America be like if we had a “fair trade” agreement that was good for American farmers and farm workers? What would food in America be like if we had a “fair” farm and agriculture policy that favored small, local farmers delivering organically grown healthy food instead of the agriculture industrial complex that delivers manufactured “food” products? What if we had “fair” food distribution so the people at Second and Cleveland got the same grocery store that is at Giant Eagle’s Market Place in Upper Wonderful? Most of all I like the cockroaches superimposed with “Gov Kasich says”. I haven’t seen this bill board in person, but will definintely drive over to check it out. I hate the sign. I realize it’s tongue in cheek but I hate it none the less. If you want to go with fair food being good for you, then emphasize the agricultural angle with animals in a healthy environment producing food that really is good for you. I enjoy graffiti but I’m weird like that. Those signs are insulting. Telling someone a high-calorie, zero-nutrition food is good for you is stupid, especially in a country with a huge problem with obesity. It doesn’t mean you can’t indulge every once and a while (I would have a corn dog if I went to the fair), but the advertising is just ridiculous.